About dialog with the new imagery. I like to think of Thunderbird as Firefox’s little sibling, and their icons historically get along well side to side together in an app launcher. Firefox is introducing a new icon in v57 though, with a far more minimal style and brighter colours, which make Thunderbird sad and complicated in comparison. 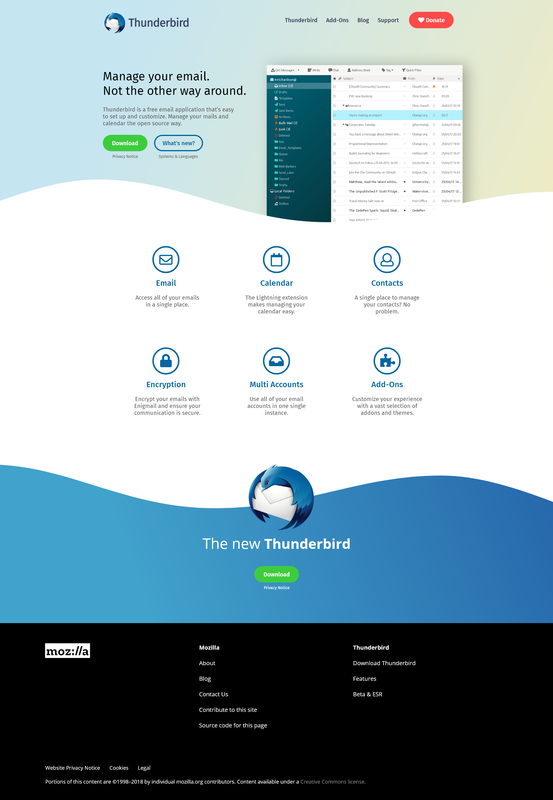 So this is a space to think about a new icon for Thunderbird (if there’s no discussion already). I’m attaching a first draft, a quick try on where a new icon could be directed towards. The blue and dark purple shades come from Firefox’s new globe, and the number of elements is reduced considerably. — The feathers here are basically the original ones with some clumsy adjustments and gradients applied to them. Without shading they look off, and are still too complex to be on par with Firefox’s elegant tail. I think they have to be redrawn entirely in a more thoughtful way, which will also have the benefit to clean up the vectors which are a mess. — The level of detail in the head is still too high. — The envelope should probably not use lines, the different folds could be done just with surfaces with offset gradients. — All the gradients and colours have to be tweaked and tweaked again. — It’s not working at small sizes as such, there’s some shaping, contrast and volume work to do in order to make it legible. Very interesting. Let me publish this a little wider. The new Firefox logo is awful, but the simplified TB is not as bad. It does not need any more dumbification. The new icon looks already good. I think the feathers are looking good now. Yes the letter could maybe be simplified by using different shades instead of the lines. Let's wait to see how your next iteration would look. I like the draft, but I definitely wouldn't remove even more details as in this first draft. I like the idea of a new icon to delineate the arrival of a major new feature,  such as webextensions  or perhaps in 59 as most add-ons will not make it without work. If this doesn't belong in Theme, please move to general for a wider audience. but I like attachment 8914003 [details] better. I think this looks amazing nicolas! Amazing, in fact. I think that we should move to adopt this. Are you in the IRC nicolas? Nicolas, had you time to work on your very promising wip? It would be great if we could get a working icon for the next ESR release. Thanks for pointing me to this bug, I was not aware of it before. Nicolas, thanks for initiating this! Your drafts look really solid! Over 7 months ago or so I was doing the same thing with the logo in fact, Good to see that there is more momentum around that. >The new Firefox logo is awful, but the simplified TB is not as bad. It does not need any more dumbification. Let's not go on this level as this feedback is not useful and more damaging than constructive. - The shape behind the eye gives the bird a more natural shape, so it needs to get right, otherwise the eye looks kinda creepy and wide open. I had that problem too as that shape had gaussian blur applied which doesn't render as SVG. So I removed that and it looks fine I'd say (I see Nicolas did the same thing). - I'd rather suggest leaving the envelope in white, as the current Thunderbird logo. - Having the bird's shadow on the envelope is a little skeuomoprhistic, so removing it to make the envelope clearer would be beneficial for the logo, especially on smaller sizes. - In the corner of the image you can see an updated Thunderbird wordmark which is in the same style as the new Firefox wordmark (Fira Sans). I'd suggest to adapt it regardless of the choice for the logo mark. These are my 5 cents. We are doing a Usability Study and Styleguide for Thunderbird in the coming months, so it would be great to have the new logo be part of this. I'd be happy to jump into a meeting if you would like that. Many thanks, Elio! Would it be possible to make the blue a little bit less bright? And what do you think about adding a darker line on the bottom of the letter to better separate the letter when the icon is on a white background? With this two questions considered, I think this icon could be ready for production. Which version will we be using? Elio 1 or 2? I like Elio 2 better. In Nicholas' draft the head and the eyes look fiercer and the bird has more feathers. My comment 18 was for Elio 2 on which we should focus. Thanks for the feedback! I just updated it according to the comments. They colors are a bit more muted now, yet still brighter than in the current Thunderbird logo. If you are happy with this direction, I can clean the illustration up and make sure it works as SVG as well (the current Thunderbird logo is not SVG friendly). It should be fine. The new Firefox Quantum logo has a similar shadow behind the fox body as well. The logo mark should be the same for everything, no matter what size. Maybe consider using the eye of Nicolas' version? I like that it's a bit brighter than the origial eye. +1. It looks fiercer, see my comment #19. I've looked at this quite a lot, I actually prefer the logo without the shadow. Other than that, I'm very on board. I agree with that. Should we move forward with it Ryan? Would like to know if there has been any process to this in the past when making final decisions. @jorg @paenglab - could you let me know? What do we need to do to move on this? Richard can most likely make the replacement of the PNGs(? ), so no JPG please, I can approve. How about making the eyes a little fiercer? We need either a patch with all images/icons of https://dxr.mozilla.org/comm-central/source/mail/branding/thunderbird changed to the new one, or the images/icons are attached here and I can create a patch. It would be good if we could, after the landing, do a beta build to check the icons are correctly exchanged while updating. Elio, could you create this images? Whether the council (as a group) wants to be included in signoff hasn't been decided afaik. As the Council is the controlling body of Thunderbird, I am certain that anything related to branding needs to be approved by the Council. In addition, as already mentioned, there needs to be a legal review from Mozilla as they hold the trademarks. >How about making the eyes a little fiercer? "Fiercer" doesn't really mean anything. As what you understand as fierce I might understand differently. The eye is the same from the old logo as I don't think I'm that great at anatomy to do such big changes and I don't think that would be part of a refresh, rather than a rebrand. > >How about making the eyes a little fiercer? > think that would be part of a refresh, rather than a rebrand. Maybe you could try to make shadow (or the lid?) above the eye a bit darker. That could make it a bit "fiercer". Philipp, what do you need for the Council signoff and legal review? Would something like https://presentator.ura.design/en/0Lv7dIbK page 4 (Elio 5) be enough? What I mean is: Make the eye colour a little lighter, as in attachment 8914002 [details] or attachment 8914003 [details]. Philipp's n-i was for the: "what do you need for the Council signoff and legal review? Would something like https://presentator.ura.design/en/0Lv7dIbK page 4 (Elio 5) be enough?" Setting it again. 4) We needinfo those people on this bug, and they approve. 5) Council considers approval final or takes action if there are comments from the legal/brand review. Given there have been 40+ comments on this bug we might file a new bug just for the legal review, but the council will take care of that. A one pager with the logo and all possible variations we'd use (beta, etc) should be sufficient for the review, we can provider further info if needed. What do you think of this Jorg? The eyes appear to be lighter. Yes. This is nice. Can we get this rolling? I think we need to get the new image approved as per comment #41 and then Richard will prepare a patch as per comment #33. Looks good to me too. Can the white envelope cause problems (low contrast/distinguishing) on white background as seen in the image? Attached a version with slightly fixed feathers. More contrast on the envelope outline (to be even more recognizable on white background) and slightly brighter eyes. I am happy with this progress as of now. Here is the icon in the appropriate sizes. Let me know if these are okay. Already began with the patch. I'm in contact with Elio because I need more icons for Mac. Ryan could you check with the counsel that this version is okay to go further? Not that we create the patch and then it's been denied. I have raised this, working through discussion (currently no dissenting voices). Vote to finalize this coming (hopefully before the end of the week). Approved, reaching out to MoFo to finalize. This is a WIP patch. The Mac icons are missing. All other are complete. Feedback welcome. This is the about dialog made with the Daily to show how it looks. This looks quite good IMO. Please do not forget to add a "symbolic" variant to be used in the GNOME panel. This is the final patch with all icons exchanged. I removed the about-background.png because this is not used on Thunderbird (the image is from Firefox Nightly). I added Jörg, Magnus and Philipp as reviewer as the representatives of the Counsil. I would be also okay with only one r+. I've looked through all the images and they all look fine. I don't know when we're going to get legal approval. We can move forward incorporating these now. Interestingly enough, the new logo must be in use for us to trademark it. > historically get along well side to side together in an app launcher. any plans to also work on a refresh for the Thunderbird Daily logo? The new Icon looks really ugly on dark backgrounds. There seem to be white pixels instead of transparent pixels on the outside. Strange, I'm looking at the images and there are no white pixels on the circumflex. Alex, what screen depth do you use (8bit, 16bit, 24bit)? The low depth icons do have this whit pixels. Alex, please could you try to exchange the messengerWindow.ico in your "TB beta directory"\chrome\icons\default with the one I attached here and check if the icon looks better? Maybe a refresh of the icon cache is needed. We should roll this back out of the Beta, I was too hasty. Legal would like to review the changes, they know we'd like to get this out ASAP. Can we roll this change back? We can, but it's already in b6. Jörg, do you do the back-out or do you want a patch? TB 60 beta 6 has shipped. Maybe you should have been a bit more precise in comment #60: "We can move forward incorporating these now." I see no point rolling anything back. Too late. If they dislike it, we can see what we will do. BTW, if you really need a new beta, talk to Wayne, he can build one from a changeset just below landing of the icons on beta. No backout required. You are in contact with someone at legal? This is the screenshot with the updated icon. Screen depth should be 24 bit. Fixed icons (see comment 74). Checked in GIMP and the bright pixels around the right and bottom edge are gone now. Final say, we're all good on this. Sorry for the confusion. Elio, do you have a SVG version of the icon? If yes, please could you add it to this bug? Now that we have an updated logo, there should be an updated page on thunderbird.net. Sadly the symbolic variant I mentioned in comment 56 is still missing. > Sadly the symbolic variant I mentioned in comment 56 is still missing. In the FX bug about the symbolic variant is also not much activity. I'm waiting for the SVG, then I can hopefully do it. Attaching them here as well. For symbolic icons, using a mail icon would make the most sense, right? > For symbolic icons, using a mail icon would make the most sense, right? I think yes, a 32px icon should do it. Then also HiDPI should be sharp. > > For symbolic icons, using a mail icon would make the most sense, right? > I think yes, a 32px icon should do it. Then also HiDPI should be sharp. Symbolic icons in GNOME are SVG on a 16x16 pixel canvas. Ideally it should be more than just the mail envelope but considering the share of the TB icon this could be hard. For Firefox, it worked out just fine. This has long been approved and shipped elsewhere. Elio, I noticed that the 32px icons used by Windows for the desktop and the taskbar aren't as good as the predecessors. Basically the eye isn't as clearly visible and I think it's lacking contrast. It's basically just like a blue blob on top of a white envelope where before you could see the eye and some structure in the feathers. Richard modified the 32px icon to make the eye (which is only 2px by 2px big) a little brighter. I'll attach that in the next comment. I think there should be more contrast, too. That raises the question: How did you create those small versions? From the SVG in attachment 8974937 [details]. Can we please fine-tune that a little? This shows a little more detail and looks less fuzzy at the edges. Still, I'd like even a bit more detail. This patch makes the 16px and 32px icons a bit more contrasty. The bird's eye is for example a bit better visible. This sizes are mostly used on Linux and Windows. The messengerWindow.ico has now, like FX, only the 32 bit icons. Attachment #8984663 - Flags: approval-comm-esr60? Attachment #8984663 - Flags: approval-comm-beta? It probably might differ bit depending on how the PNG's are exported. The SVG shouldn't be changed however. Is this fixed? We didn't touch the SVG, but we tweaked the PNG and ICO files a little. Filed bug 1469213 for the 22x22, 24x24 and symbolic icons. re :The new Firefox logo is awful, but the simplified TB is not as bad. It does not need any more dumbification. I have some agreement with this statement. The new icons are flat, childish and lack definition. They look unfinished; that's assuming the lack of definition really is part of the intended design. This type of 'look' is not going to be appreciated by everyone. It is like a tempoarary fad that  will not last. Classic quality looks have always lasted. It would be much appreciated; probably by many in community, if the previous 'default theme' as used pre version 60 for general UI and logo, could be made available as as one the selectable 'default themes'. Why do we hide critical comments with tag "advocacy"? Please don't. I am honest and honesty should not be seen as a bad thing. My opinion was meant to be taken as a useful piece of critic to be taken on board. What purpose is served if you do not allow honest opinons when it comes to design. Not everyone will agree on everything, but it is useful to have some idea on how the target audience may react. Deliberately attempting to suppress important critic comments is not helpful to anyone. As the new design is rolled out you will expect some people to like the new design, others will not and some will not have even noticed anything. Some people will not appreciate radical changes as it harder to adjust for a number of reasons. I would not consider your comment very constructive and calling that "honest" is not helping as well. You stating your opinion in a way which makes it sound ultimately the sole thing which is right, is not really an opinion anymore. For the time being, Thunderbird is still part of Mozilla and is following the Photon Design System, similarly to Firefox. There are various reasons why the logos and icons are updated and this is mostly due to legibility and fidelity on very small sizes. adding more color contrast as well. It would have been helpful to have a discussion on this level, rather than "it's childish" and blowing off steam here. If you'd like to pursue that, I'd gladly address any of your points. this is mostly due to legibility and fidelity on very small sizes. adding more color contrast as well. What small screen devices is Thunderbird designed to be installed on? There is a community version out there I understand that will run on a chrome book. However Thunderbird is still a desktop application. Most folk I would assume are on at least 15 inch laptops (Dell entry level appears around 15 inches) and most desktop users are playing in 20 or more inches. For 10 years I have been seeing more and more design decisions based on the size of someones finger and the size of their iphone screen. All very good if you are using a small touch screen device and are developing applications designed to appeal to that market. Just as putting touch controls at the bottom of the screen on a phone makes sense, (even if it is not intuitive for those used to a desktop), doing such on a desktop is a seriously poor decision. Microsoft proved just how much of a mistake it is to build touch interfaces for non touch devices (Windows 8 anyone). The reality is Thunderbird is a desktop application and if it survives the transition to Firefox becoming blindingly great will be for some time to come. While there might come a time when there is a version for these small screen devices Firefox is aiming for, some serious decisions are going to have to be made over memory requirements and storage space. You don't dump a +20Gb profile into a cheap phone and not expect trouble. So lets talk design. We are mostly dealing with large screens in high resolution colour with slow drives where the users primary interface to the software is visual cues and a mouse. When my copy of Visual studio arrived with glyphs on the tool-bar I was unbelieving that they could conceive of it as a good Idea. Then I got to god awful Windows 10 apps. So it became clear to me that we had a new design fad in town. Flat ugly and difficult to describe, such is life. Now in support we are trying to describe glyphs using words (no colours any more) So you have people talking about the "hamburger" icon and the Three horizontal lines. So please lets not down on Anje for expressing her opinion, however unwelcome it was, and move on to designing an outstanding user interface for Thunderbird. If we have to follow the touch interface model, then we need more default choices in the themes than dark and light. I am now talking through my hat, but it is my feeling that Thunderbirds user base contains a significant number of "silver surfers" so any design decisions need to take into account the realities of life as you age. New things become harder to learn, eyesight is failing and old habits die hard. So telling someone that they no longer use the green icon because we don't use colour now is an affront to their independence as they have extreme difficulty unlearning the icon is green. Let's have the discussion about design concepts somewhere else. This bug is closed and we adopted a proposed icon/logo.